How about we blur the lines between breakfast and dinner? I’m sure you’ve heard of a burger with an egg on it (anything is better with an egg on it). Breakfast for dinner is a rare treat that should be enjoyed more often. 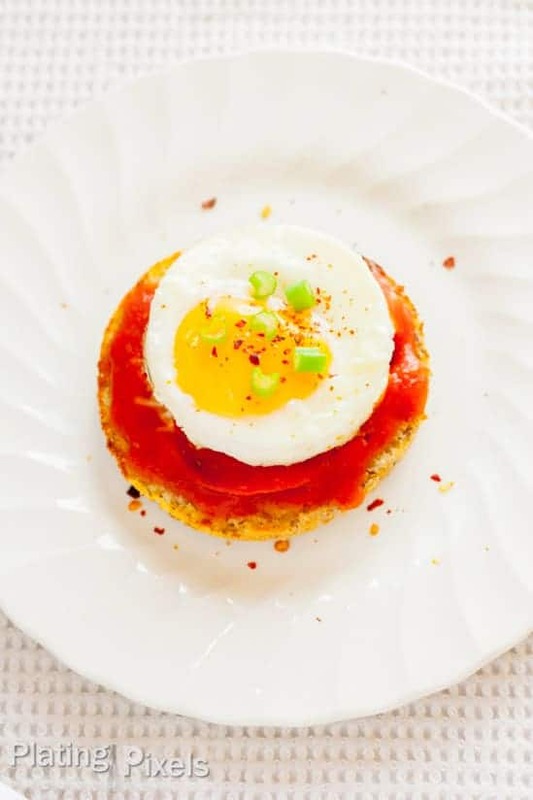 This Sunny-Side Up Egg and Pizza Breakfast Muffins recipe will help with those early morning pizza cravings. No? Is it only me that has those? 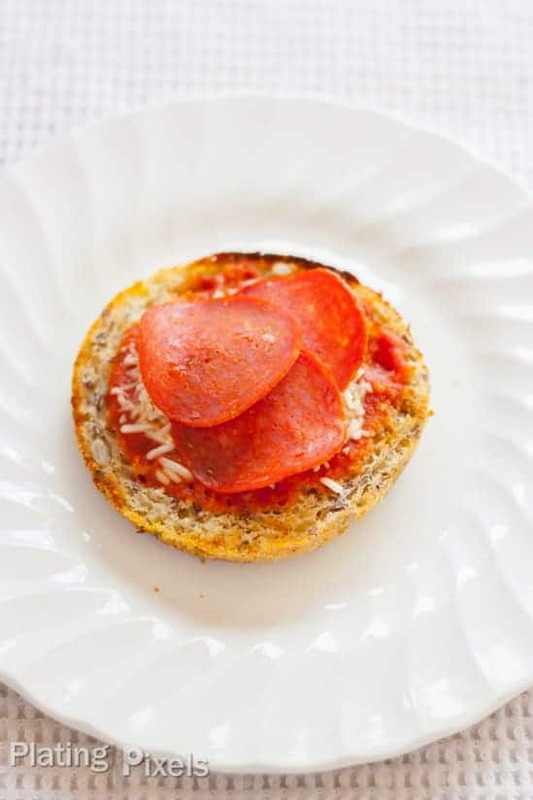 These pizza breakfast muffins are quick and much healthier than their original inspiration source. Turkey pepperoni reduces the fat and just a small amount of mozzarella cheese is needed. Use whole-wheat English muffins to get those all-important whole-grains. 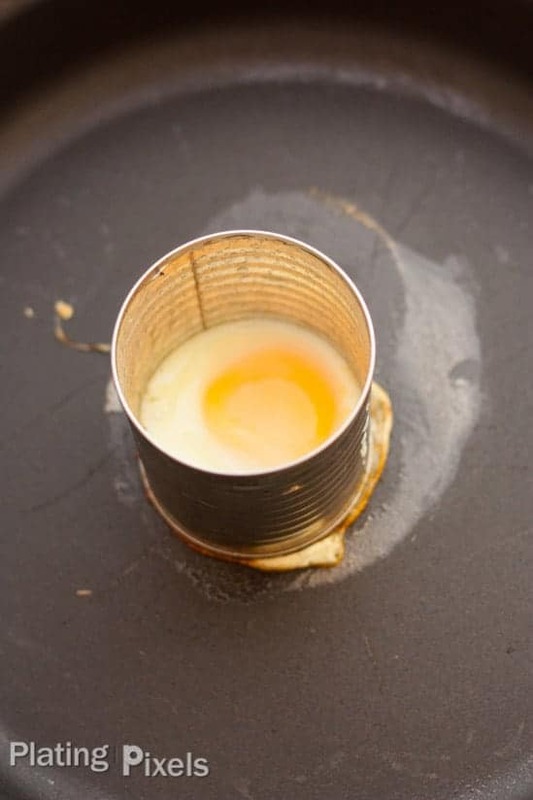 To get that perfect round hockey puck shape with your eggs, I came up with a kitchen hack. Remove the top and bottom of a 14.5-ounce aluminum can, as well as the outside paper wrapping. Clean well and place in the middle of your pan. Crack an egg into it and cover with a small place (see picture below). Cook the same as in the recipe instructions. 15 minutes is all you need for this entire recipe, including cooking the eggs. If you like your eggs a bit runnier you can shave off valuable seconds from the recipe time as well. I know how precious all our time is. Thanks for reading this by the way, and following along with all my recipes as well. For sunny-side up eggs, I recommend a high, then low heat cooking method. Adding the eggs to a hotter pan helps set them and keep the whites from running too much. Then immediately reduce the heat to low and cover to slowly cook the eggs all the way through without burning the bottom. Each and every recipe on Plating Pixels has food photography and food styling tips. I hope home-cooks and food bloggers can learn valuable information from these. I shot this in natural light at 1/200 sec, f/ 4.0, ISO 400 . There’s so much contrast between the red of the pizza sauce and the white of the egg. A simple white plate over a textured white linen is all that’s needed to make the muffin jump out of the screen. A bit of sliced green onion is added for color variation and a focal point. Colorful herbs and vegetable garnishes are an ideal way to add visual interested to otherwise simple dishes. 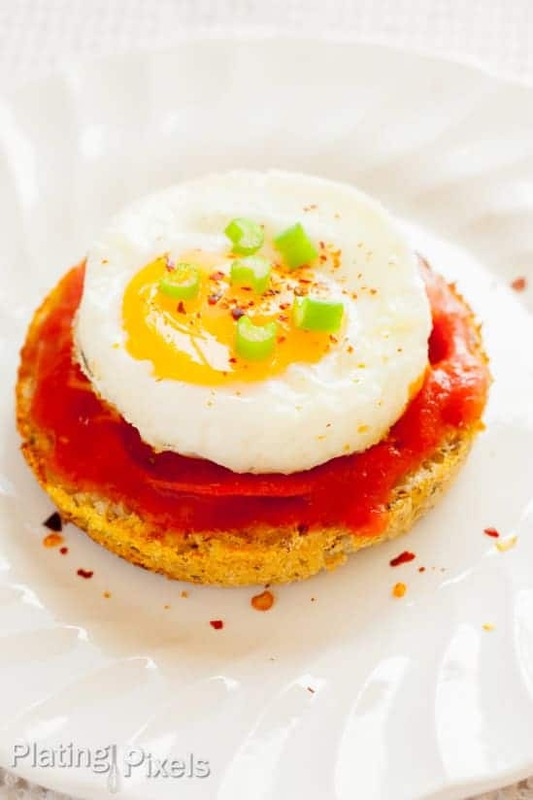 Sunny-Side Up Egg and Pizza Breakfast Muffins. 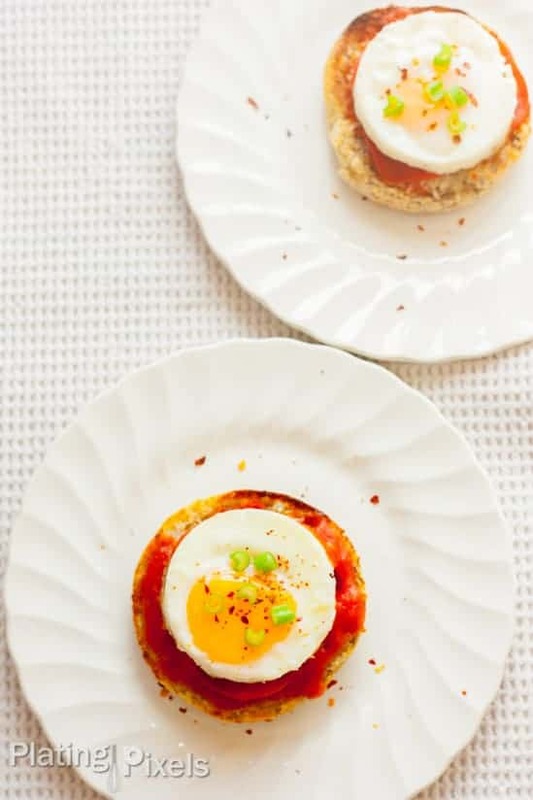 Pizza dinner for breakfast in these easy egg muffins. Turkey pepperoni, pizza sauce and mozzarella cheese. Preheat oven to 400º F. Heat olive oil in large non-stick pan on medium-high heat. Crack eggs into pan, evenly spaced apart (they may end up touching each other). Immediately turn pan to low and cover. Cook eggs for 4–7 minutes depending on how runny you want them. Do not flip eggs over; remove from pan once cooked (this method of cooking is sunny-side up). Place English muffins on a foil lined baking sheet. Evenly spread sauce onto each muffin half, top with cooked egg, mozzarella cheese and pepperoni. Sprinkle with salt and pepper. Bake at 400º for 5 minutes, or until muffins are slightly toasted and cheese is melted. Remove and garnish with optional green onions and/or crushed red pepper flakes. Hi Kate. You can never have too much breakfast. Glad you found this interesting and hope you enjoy! Hi there! I love your blog, and you’ve got good recipes. Keep it up. Hi Isaac. Thanks for the compliments and glad you like the blog and our recipes. A comment like that means a lot and is very encouraging. Thanks for the SSU egg tip. I love mine that way, but it’s always a crap shoot. No more! Glad you found the cooking tip helpful Chrissy. It’s a great way to keep those runny eggs in a nice round shape.